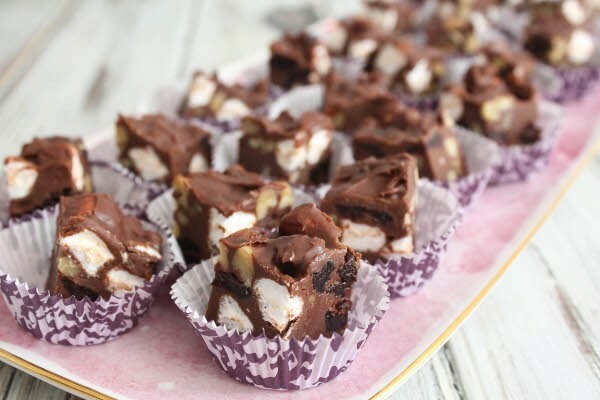 Homemade fudge, easy fudge, microwave fudge, condensed milk fudge, 3-minute fudge, party dessert, midnight snack, and post workout treat (that’s right). All these can describe these chocolate squares I am sharing with you today: little treats studded with mini marshmallows and chopped walnuts – the classic flavors of Rocky Road – plus boozy cherries. Boozy cherries are dried cherries that took an overnight bath in Cointreau. Soaking the cherries in orange liqueur results in plump and juicy pieces, sweet and tart at the same time. I love chocolate and cherry together (as evidenced here, here, and here) and even more so when the cherries are infused with alcohol. I started baking with boozy cherries a couple of years ago and I’ve been hooked ever since. I’ve been known to double or even triple the amount of orange liqueur when soaking dried cherries. Then, after fishing out the boozed up fruit, using the now cherry-infused liqueur to make cocktails. When I say “I’ve been known to do that” I really mean I’ve done it just once but plan to keep doing it many more times in the coming months. I’ve also been known to taste-test my homemade fudge incessantly. Ceaselessly. Without fail. Like I’ll try it while it’s still warm in the bowl to make sure the flavors taste right. Then I’ll try a square after the fudge has chilled. And another one that’s been sitting in room temperature. Then another square after a few days to make sure it doesn’t taste like cupcake liner or something. And another square right before bringing it to a friend’s house because what if it’s not good anymore? And another one for good measure. When I say “I’ve been know to do that” I really mean I ate seven pieces of fudge. I mean eight. But who’s counting? 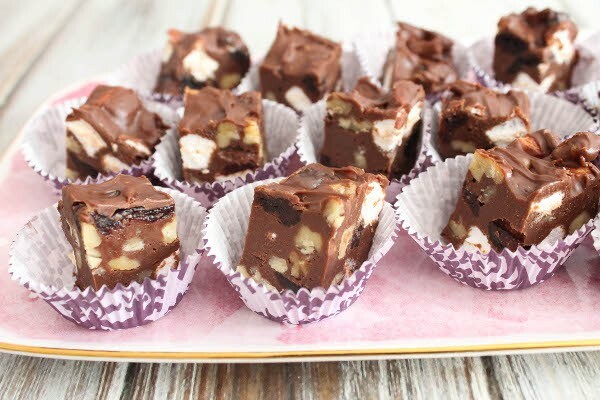 I love that this fudge has a lot of different flavors and textures in each bite: soft and pillowy marshmallows, crunchy buttery walnuts, tart and boozy cherries, and sweet and creamy chocolate. This is ridiculously easy to make – it only takes about 3 minutes to prepare (but you’ll need to make the boozy cherries a day in advance and the fudge needs to cool for a few hours). There’s no need to turn on the oven because it’s a no bake treat, and as an added bonus, it’s also gluten-free. Make the boozy cherries. In a medium bowl, combine the dried cherries and Cointreau. Cover and let cherries soak overnight. make the fudge. 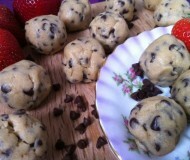 In a medium microwave-safe bowl, combine chocolate chips, condensed milk, butter, and salt. Heat on full power for 1 minute, then remove and stir. Everything would have started to melt but you’ll still have some lumps. Heat again in 30-second intervals and stir until the mixture turns smooth. I heated everything for a total of 2 minutes. Fold in marshmallows, walnuts, and boozy cherries. Scrape the mixture onto a foil-lined and buttered 8x8 inch baking pan. Chill in the fridge for at least 2 hours, then cut into 1-inch squares. 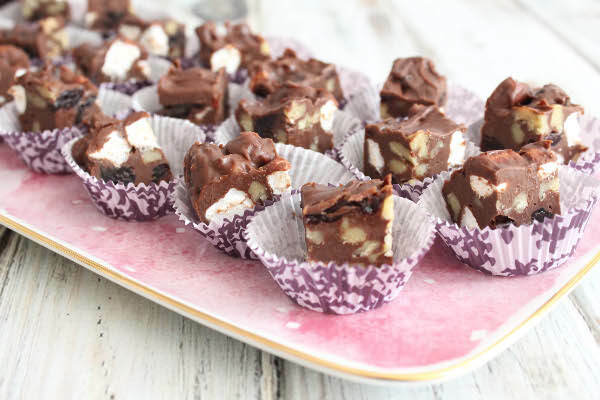 If you want to try other easy fudge treats, check out my other recipes: Nutella Fudge with Espresso Salt, White Chocolate Fudge, Salted Peanut Butter Fudge, and Chocolate Fudge Bars with Toffee Bits and Peanut Butter Cups. these look wonderful..and boozy cherries seals the deal for me. Fudge is such a great, easy treat! 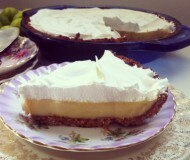 Yes, and always a crowd pleaser, too! Yay I’m so glad you appreciate it! Yes they are :) Thanks Sues! Anyways this is my kind of fudge: chocolate + marshmallows + wasted cherries. Sign me up! Haha yes full on drunk and wasted cherries are now my new favorite thing! Boozy fudge – now that is fun! This sounds so good! I don’t think I’ve made fudge since the holidays! 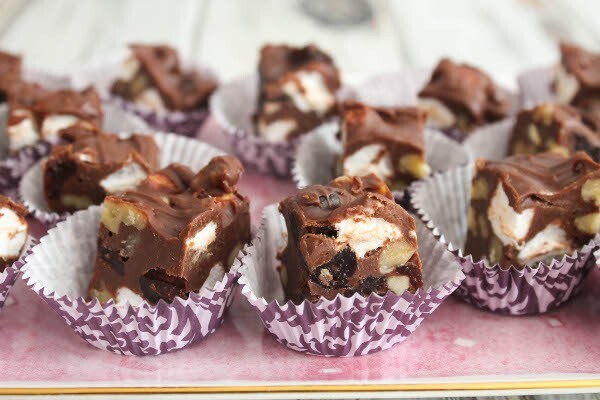 you’re living up to your blog’s name with this one–awesome fudge creation! Fudge is absolutely amazing on its own but adding cherries was genius! Hi, Bianca! This is my first time commenting on your blog, but I really neede you to know that when I saw that picture with those watermouthering pieces of fudge I had a heart attack! Seriously, I’ve been able to put together all the things that I love ( and I shouldn’t , my waist and hips are not thanking you! :P) and make little pieces of haven. Anyway, Congrads and you have an awesome blog! My eyes just fell out of my head! 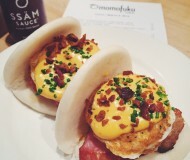 These look absolutely utterly scrumptious! I mean, BOOZY CHERRIES. What more could you want in life?! And then you stuffed them INTO FUDGE. You slay me in the best way.